Seoul mountains represent a unique feature for a major metropolis. Even from downtown, you can enjoy great daylong walks across picturesque sceneries. If you think traditional paintings of royal palaces look too stylized to be true, just take a two-hour hike up Mount Inwang (Inwangsan) and along its fortress walls, and enjoy the best view over Seochon, the Gyeongbokgung, Cheong Wa Dae, the city center and Namsan. As you rise, parts of Gangnam and such landmarks as the COEX or the 63 Tower join the party in a memorable panorama. Let's zoom out for a minute or two. I've been following very closely the dramatic changes under way in the heart of Seoul and particularily around its main axis Sejongno. 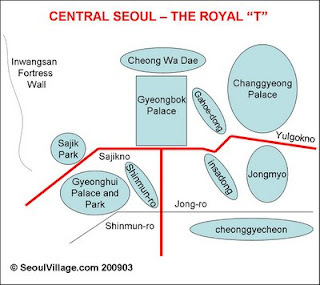 If you consider the "T" leading to the Gyeongbok Palace, the upper bar doesn't look as nice as it should since both sides lead to ancient royal shrines. But change is coming. The past few months have seen dramatic changes along Sajikno. Just last month, a derelict pedestrian overpass connecting both sides of Naeja-dong has been removed, and soon, a crossing shall dramatically shorten the walking distance between Gyeongbokgung Station and Sajik Park... which is itself undergoing a spectacular lifting : exit the giant concrete platform, enter a new gentle slope towards Inwangsan-gil and the mountain. Marked by Hongsalmun (홍살문), the gate of Sajik-dan (사직단), Sajik Park itself may not look very spectacular right know, but it does hold a special significance (as fundamental as Jongmyo and Gyeongbokgung for the King) and host many cultural events, most notably the traditional rites at Sajik-dan and Ye-dan. The small squares where almost shamanic rites were performed in favor of food and agriculture stretch peacefully without really leaving ground. And neither Hwanghakjeong (archery pavillion) nor Tangun Shrine (devoted to the mythical founder of the nation), both behind the park, open their gates every day to the public. Just meters away from the shrine, the hulk of Jongno-gu's Cultural and Sports Center can help locate the beginning of the Inwangsan fortress walls. Considering the clearing being prepared just across the street, I guess a more specific building shall welcome hikers and tourists in a not too distant future. For the moment, the most convenient landmark is this shanty drugstore one block away from the Cultural Center. Behold, You Who Cometh to Ascend the Great Wall : as I write these lines (this may change soon), this ruin happens to be your last chance to purchase a snack or a bottle of water, and the Center your last opportunity to empty your bladder indoor. On the way up, no facilities can be found except a few trashcans, and a couple of army sentry boxes. Note that you are entering a formerly restricted area overlooking the Blue House and sensitive bases. The Inwangsan park was closed after the 1968 assassination attempt of Park Chung-hee by a North Korean commando, and reopened in 1993. Taking pictures of Cheong Wa Dae, littering the place, or firing a missile on the Government's HQ are stricly forbidden. The first portion of the ascension remains a civilian area, and is turning into a pleasant neighborhood park, with a small wooden platform overlooking the city. Here, the XVth century wall separates Sajik-dong from Muak-dong. It goes all the way up to the summit, and its restoration is now almost completed ; higher up, you can see a temporary rail running along it, probably to carry the heavy concrete stones. This part was restored earlier, and the Gu is now focusing on making the place an ideal place for families to rest or picnic. Gardeners are cleaning the bushes, planting new trees, and removing most weeds or detritus. Unfortunately, the authorities, felt compelled to add the usual gym equipments, and I'm afraid I know where they plan to install them : the small wooden platform may become a large concrete terrace, ruining the charm of one of the cutest spots. These days all trees are blooming, and later in the year, you can pick apricots while strolling. But March-April has its advantages, particularily since the view isn't blocked by vegetation. I was surprised to see many families with very young children go all the way up, which includes a vertiginous walk on a rock at the top, and the second section of the ascension, marked by a grilled gate leading to a narrow and steep staircase (the only unpleasant part of the journey, and it doesn't last long). The third section leads to the granite top of the hill, along the serpentine wall and a not too demanding slope. To the left, the view improves from apartment buildings to Inwangsa, and then to a pine forest. To the right, Bukhansan's majesty becomes clearer as the vegetation grows thicker. Behind you, Seoul keeps revealing itself step by step. From the rock, next to an army barack, you can see Gangnam even behind Namsan (274.5 m high, compared to 338.2 for Inwangsan). This is the intersection of Muak-dong to the South, Hongje-4-dong to the West and Nusang-dong to the East. It could be the perfect spot to finish the ascension but then, just on the other side of the rock, you discover the fourth section : a welcoming clear path leading to the round dome of Bukhansan. The beauty of this hike that at each station, you can either enjoy the view and call it a beautiful day, or venture one step beyond. * the Southern flank of the park is getting ready for Gyonam New Town : the block of small restaurants separating the Gangbuk Samsung Hospital and the Gyeonghuigung entrance will be replaced by a public garden, which has already been partly opened along the newly restored wall.